Stranger Things will not gather dust on your CD shelf or be consigned to the trash bin on your desktop. My sole memory about Edie Brickell & New Bohemians is being ten years old, sitting in the passenger seat car of my father's car, and hearing the radio announcer proclaim that Brickell's voice on "What I Am" was a fusion of Karen Carpenter and Janis Joplin. My awareness about Edie Brickell & New Bohemians extended to that memory until last week. Stranger Things marks the reunion of Edie Brickell with the New Bohemians after the group disbanded in 1990 with only two albums to their credit on Geffen Records. Fortunately, time has been kind to the band's brand of jam-rock so their return folds easily into a market that has made Jack Johnson a double platinum-selling recording artist. The beauty about Stranger Things is that it does not belong to 2006 or any particular time period. (It could easily have been an immediate successor to Ghost of a Dog (1990) had the band not separated.) 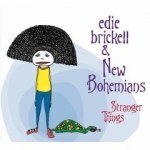 Edie Brickell and New Bohemians eschew trends and that's why Stranger Things will not gather dust on your CD shelf or be consigned to the trash bin on your desktop. Produced by Bryce Goggin and the band, Stranger Things is satisfying from beginning to end, even though a couple of tracks -- "Long Lost Friend" and "Elephants and Ants" -- might work better during band rehearsals. Kenny Withrow's voltaic guitar intro on the opening title track exemplifies a band whose musicianship merges feeling with technique. Creative uses of percussion by John Bush on "No Dinero", "Funny Thing", and "Spanish Style Guitar" spice up the recipe and are as crucial to the songs' atmosphere as Brickell's voice. (By the way, Brickell sounds nothing like Karen Carpenter or Janis Joplin or a fusion of the two.) "Early Morning" is chock full of different sound textures. The quiet din of a gong, clink of a triangle, and jangling of sleigh bells create a cozy soundscape for Brickell to warble about venturing into the dawn with a lover. The vibrations of Withrow's guitar wash over you like snowfall. Brickell's phrasing on "Lover Take Me" marks the album's most sensual moment. Her reading of the line "There was a time I was alone/ And wanted to be free/ Those times are gone" is a study in nuance. She gives each word its due importance so there's no misinterpreting her thirst for love. Because I grew up listening to LPs, I often section albums into Side A and Side B. Whether or not this is intentional by the band, "Funny Thing" seems to be the thematic bookend to "Stranger Things" on what would be Side A. "The minute you get what you want you don't know what you want anymore," Brickell sings to her non-commital lover on the title track. Six songs later on "A Funny Thing", Brickell's lover is back and appears from "out of the blue". She sings, "I nearly fell off the ladder/ My heart filled with laughter" and concludes "I believe I was born for the boy/ No doubt in my mind." All this may be conjecture but, like the cartoon cover image of a day-glo stick figure standing next to a smoking turtle, the band delights in appealing to the listener's whimsy. Edie Brickell & New Bohemians are like those friends of yours who have a bunch of great songs that you want everyone to hear. Fantasy Records, now an imprint of Concord Records, has a strong record with Stranger Things. I hope I see more than this review promoting it.